For those of you that have decided to take the winter off from riding you are missing some choice opportunities! 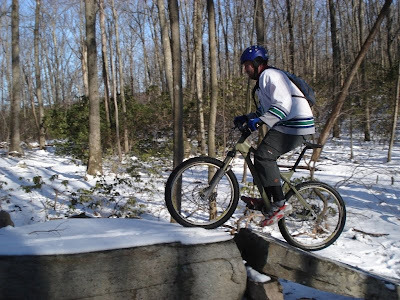 The CT Chapter of the New England Mountain Bike Association held it's first annual Winter Social called Middletown Madness and I organized the advanced ride at Millers Pond State Park. There was an excellent turnout, 18 people and one dog showed to ride in 23 degree weather. There were three singlespeeds and three 29ers, too. 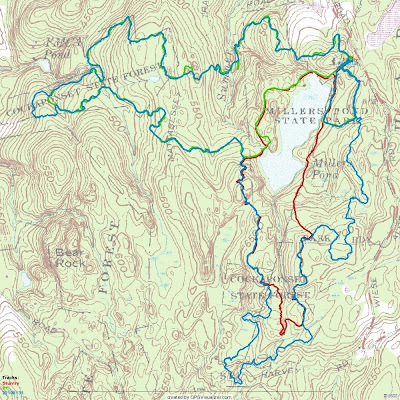 Tren and I got there a bit early so we got ready and knocked out a quick 0.7 mile loop on down along the water and then cut back in towards the red trail. Snow was simply perfect! Four inches and still a little powdery. I noticed when I stood out of the saddle that something was creaking, it sounded like something grinding. First I thought it might be pedals but then later I figured it must be the bottom bracket. Once back at the lot, people started showing up. Sign in went smooth and by 1:15 we rolled out. Having only ridden here twice before I found someone who rides here frequently and asked if he wouldn't mind leading the ride. I did however have both tracks from my two previous rides loaded onto my GPS so there was no way we could have gotten lost. Despite the creaking bottom bracket riding the technical, stuntry trail was a blast. The quick ups and rollers were a lot of fun and I felt great being able to keep up with the majority of the geared riders. Of course there were a few sections that were pretty sketchy or steep and I walked them but I was still in front of the main body so who cares? The first mile or so was on some rocking technical trail that I had never been on before and I was eating up on the Dillinger. Somewhere along the way we got on a section that I was familiar with but then last that ended and we were again another unfamiliar section. When I was shooting some video of Mike doing a drop we looked at my GPS and Mike said we must be on the outer loop which is something I have never ridden before. After the 10 Commandments I knew were close to split off that would take us back to the cars but I was really itching to ride the XC trail. The first section of the XC trail is so fast and flowy, and the perfect trail for my bike. About half way through, though, you could feel the temperature dropping and that is when I noticed that my toes were starting go numb. I started walking more of the hills just to get circulation back in the toes. For more pictures and some video, click on over to the CT NEMBA blog. Now that the 'Horse is laid up, shock went back to Marzocchi for a rebuild and I probably need a new BB for Dillinger, looks like I am riding the Qball Monster - probably have to grind some more gravel. glad to see you're getting out and riding anyway. keep those cranks turning!